At the top of my list of New Year’s resolutions is “spend more time with family and friends.” I know that’s the best way to create long-lasting memories because I remember many happy gatherings at Grandma’s house. We had dinner every Sunday, many of them on the patio in the sunny backyard. 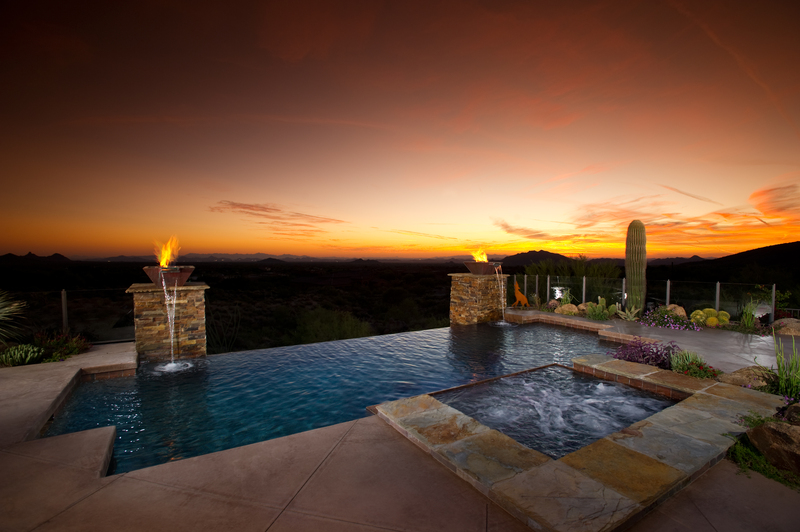 Thanks to California Pools & Landscape you, too, can have the ideal setting for gatherings with family and friends. That’s because the company is committed to helping customers create the backyard of their dreams. “We are outdoor specialists,” says Jeremy Smith, owner. “We do everything – the entire project from building a pool to landscaping.” And the company does as little or as much of a project as you, the customer wants. “We help create a beautiful backyard and homeowners are part of the process all the way.” And, an average-size project can be completed from start to finish in just five to six weeks. Jeremy Smith exudes enthusiasm for his company, the projects and service to customers. A few years ago when the real estate market changed dramatically, Jeremy asked himself, “Are we a luxury item or something different?” The answer was obvious. He wanted to serve customers, to help them take pride in their homes and add something of lasting value. Whether you want to add a new pool or spa, upgrade your pool to incorporate current styles, or construct an outdoor kitchen, patio and fire pit, it all starts with California Pools’ design team. They’re project managers who create 3D designs at the very first meeting with clients. That meeting and the estimate are free, by the way. You’ll be asked about your dream backyard, how you like to entertain and what you want for your children or your grandkids. The resulting 3D plans are so realistic that you can see yourself walking around the pool and even swimming in it. With a click, you can change the tile color, the patio pavers and the landscape. “It’s a really neat way to show what the finished project will look like,” says Jeremy. “People love it.” It’s your backyard, but the designers facilitate your vision. They want it to be right because you are the one to be using the finished project. That commitment has resulted in many satisfied customers. Since 1988, California Pools has built over 20,000 pools and not had a single Registers of Contractors complaint. They’ve also received several awards. “We’re the most decorated pool company in the country for our designs,” Jeremy says. They’re also the largest bonded pool company in Arizona. “We run our books like the family checkbook, believing that we should not spend more than we’ve got.” Not being in debt gives California Pools a decided advantage. They’re able to pass along savings to customers on travertine, stone and water features, because labor costs are low right now. That results in a good return on your investment. Jeremy Smith serves as president of the family owned business, which was founded 25 years ago by his parents. His wife, Stephanie, is the Accounting VP. Theirs is not a normal business story; the Smiths consider their employees their friends. And business has been so good, that they’ve hired around 25 people in the last half of 2010. For ideas for your backyard, visit the California Pools web site, www.calpool.com, to view several styles of pools, before and after upgrades, outdoor kitchens, patios and more. Then contact California Pools and get started on creating the perfect spot for your own cherished family memories.